Domonique + Joshua | Intercultural & Interfaith Wedding | Beach wedding photographerI absolutely love this couple. I have known Dom since she was an Engineering student at Cal Poly. I also remember her dating Josh during this time. I was so honored to have her ask Renoda Campbell Photography to photograph their wedding. Avila Beach is a very popular and beautiful destination. There were many tourists watching the ceremony as it took place. The couple also received many congratulations as they walked to the ceremony site. During the ceremony, the couple both jumped the broom, an African-American tradition, and had the breaking of the glass. The reception was a lot of fun and jam packed! They played the shoe game . Instead of using shoes, they used Barbie dolls dressed in bridal attire. There was also the Hora where the bride and groom were lifted on chairs during the Hava Nagila song. “Although the story really begins the week before Freshman year started at a fraternity house and includes many nights dancing together at parties, we are going to start our story halfway through our first year at college. Thanks to having mutual friends dating each other the couple began to spend more time together. Eventually, near the end of Winter quarter, they started spending some time alone(1). This mainly included him helping with flashcards and buying her Starbucks as a reward, as well as going on late night walks discovering the hidden parts of campus using only the moon as their light. She claims that she wasn't falling for him, but the many late night taquito meals she provided(2) and early morning smoothie/donut deliveries directly to his room beg to differ. One night they went with some friends on a night hike to Pirate’s Cove (where he later proposed) to watch the sunrise, not realizing that you cannot watch a sunrise over the Pacific. This is the agreed upon date where they started liking each other, though we can see that is not the case for her. Before the quarter ended she invited him to play on the softball team she was starting up in Spring. Even though you can take one look at him and clearly see he is athletic enough to play any sport at a high level, he was able to convince her that she needed to come over during Spring break to give him some lessons on throwing. This was clearly supposed to take place as she somehow got lost on a two-stop BART ride, but that did not prevent this practice from happening (although he should have picked her up in his car). When they returned to school and as the sun began to come out for Spring quarter, so did a couple of sweet and odd quirks. She began her habit of drawing him cards for different occasions; that was sweet. During down time while hanging out she would draw her made up character Dog-Boy everywhere, including his arms and legs; that was slightly odd. He was also given a very short list of foods that she was willing to eat–and a page and a half long list of foods that she would not even touch. This was perfect for him as he was planning on asking her on their first date. The date did not start well for her as she spilled yellow sunflower pollen all over his white tee. He laughed it off though and they took the bus downtown to have some Firestone and frozen yogurt. One night he gained the courage to ask her to be his girlfriend. She seemed hesitant at first, clearly pretending(3), but the answer was always going to be yes. As the year came to an end he was worried they weren’t going to see each other over the summer and things would come to an end. Even though they did not have a plan, he clearly remembers her last day on campus Freshman year in her white and yellow dress with the big bow on it with the biggest and most beautiful smile he had ever seen, and knew he would make it work. It ended up not being hard at all as they only lived 20 minutes from each other and both got jobs at the mortuary. Somehow, even though he got her the job, she got paid more. He’s still bitter to this day about that. The rest of their time in college provided plenty more chances to grow together and experience new adventures. During their Sophomore year he broke his ankle a few hours before midnight on New Year’s Eve (thanks to one of the groomsmen) and was on crutches for a few months. She was then tasked with driving him around and helping him with his chores. They then spent that summer teaching S.T.E.M. classes to an elementary school in Oakland(4). Their Junior year they took their first big trip to Pittsburgh, PA for the Nationals conference for the National Society of Black Engineers. That summer they spent together in SLO taking online classes and working at their job in the administration building (this job she got him). Finally in their 4th year they started doing things outside of SLO, such as taking day trips down to Santa Barbara, and finding their favorite coffee shop in Morro Bay. At the end of that year he graduated and moved back to the Bay Area while she stayed in SLO to complete her final year. They spent many nights video chatting each other and split traveling to see each other every other weekend, cramming as much fun as they could in such a short amount of time. While things seemed so promising, their path took a turn for the worst. Even a glorious trip to Brazil for the World Cup could not help them through their differences on how they wanted to live the next few years of their lives. He then moved to live in San Francisco and she lived in Pleasanton. Even though they were an hour apart and rarely spoke, the love and chemistry was never lost. Eventually he moved out of the city, quit his job, and did some traveling. Before him leaving for Europe they had dinner and feelings started to rekindle. Upon coming back, things picked up right where they were left off. She visited him in Las Vegas for New Year’s Eve and they eventually deemed themselves a couple again. After a few more months of enjoying their newfound relationship he finally decided it was time to propose. He took her down to SLO, to Pirates Cove, the place they agreed they first started liking each other, just as the sun was setting. He snuck her friends down to take pictures, but they came out too early. He then put the ring on her finger, forgetting to ask her the question. She kindly reminded him and then said “Yes!”. They then popped champagne and spent the next 10 months planning the wedding." "Most of these new hangouts were sparked by him “forgetting” his glasses in her dorm, and leaving again without them. Her Costco taquito bill tripled per month due to this. She enjoyed watching him play soccer with the kids during recess." I have no doubt that this lovely couple will have a successful marriage with a lot of love, sense of humor. Not many people know this, but San Luis Obispo, CA is a popular destination wedding location. Audrey was a very special bride to me. She was my second photographer for one summer in San Luis Obispo. We kept in contact even after she moved to Northern California. On our photography journeys, we would talk about our love for photography, cameras, (we both use Canon cameras) and our careers in photography. We dreamed big and made each other our accountability partners, until her big move North. When she said she was getting married, I was so excited for her! Not only that I would be her photographer, but I wanted her to find love and be happy in her private and professional life. Here’s what Audrey had to say about how she met Josh: “We met in the 6th Grade. I always called him ‘my best guy friend’ until now.” Audrey said she turned around one day after many years and thought differently about him. Their friendship turned into romance. They had their son and one night, he proposed to her in their son’s room. 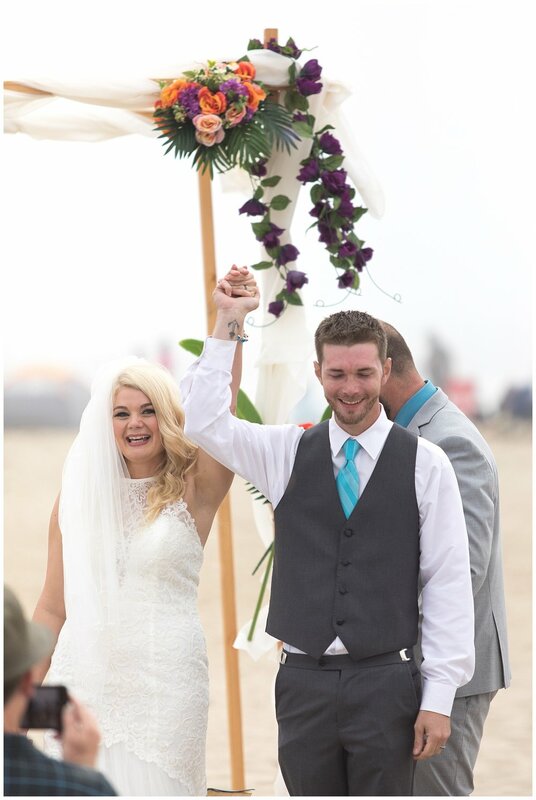 Both Audrey and Josh love the outdoors and the ocean, so chose Pismo Beach, CA as their wedding destination. 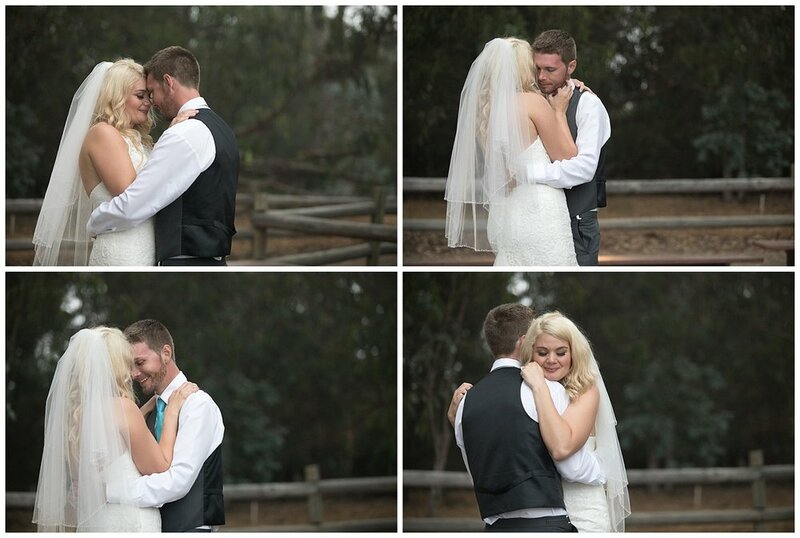 They were also the first to have their reception at the Pismo Beach Monarch Butterfly Grove in Pismo Beach. The family and friends who attended had a great time! I look forward to seeing how their family as well as their love grows. 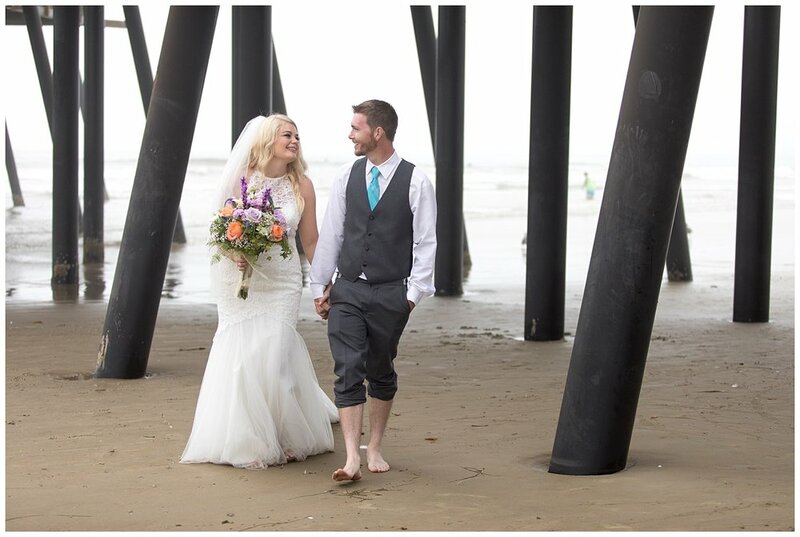 Annelise and Seth wanted to have a destination wedding at one of their favorite locations, Pismo Beach, CA. 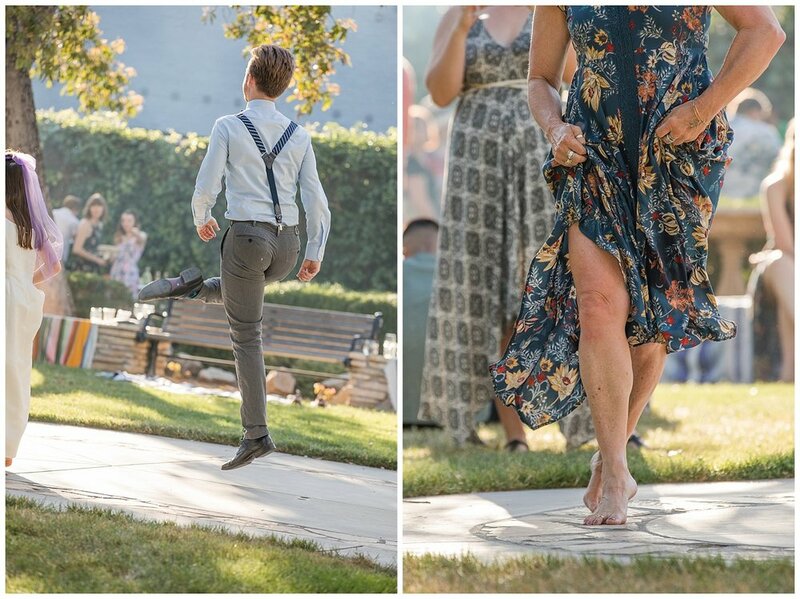 This adorable couple wanted to get away from hot Fresno to enjoy their nuptials at a cooler and beautiful location. They did bring the heat with them to the Central Coast. It was a very hot 96 degrees on the beach with no breeze. It was okay, there was so much love in the air. I hadn’t watched Dr. Who so I was a little concerned over how the details would look. It was a fun-filled and nerdy atmosphere for all. 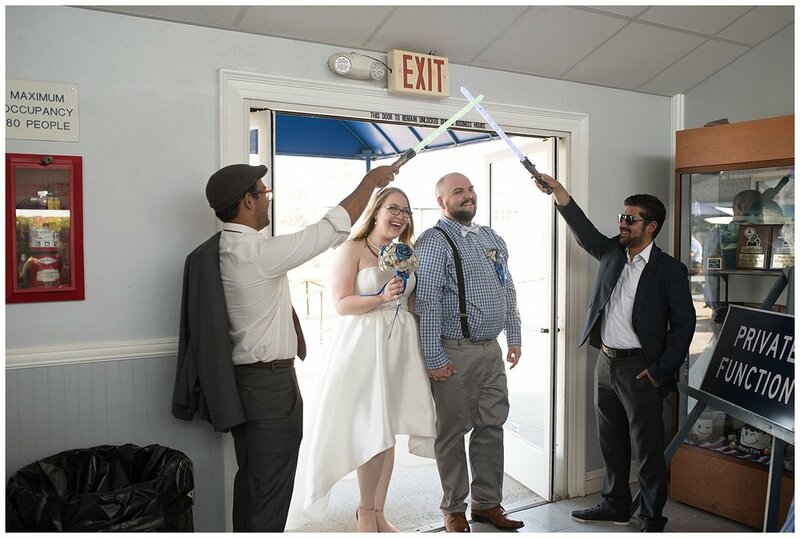 The couple did not have a first look, so all of the group images were done after the ceremony. After the beach ceremony, the group celebrated at the Pismo Beach RV Park. There were fun details at the reception. The reception location was adjacent to the beach, so we had fun doing sunset photos. Thank you for choosing Renoda Campbell Photography as your photographer!